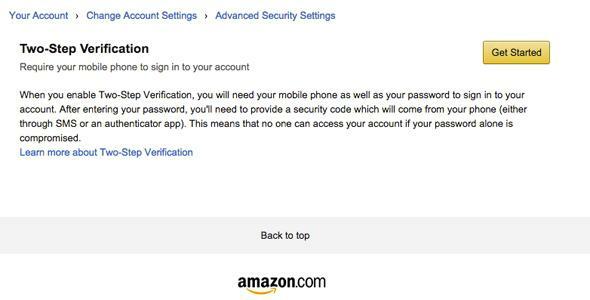 Amazon walks you through the processof adding two-factor authentication. The more people hear about big corporate hacks in the news, the more they want to protect themselves. But if it takes too much effort, a lot of people will give up. So to improve account security while also keeping things simple, most mainstream digital services have started offering a feature called “two-factor authentication” over the past few years. And Amazon is finally among the enlightened. Amazon has been notably missing from the list of services (Google, Facebook, Twitter, even Venmo!) that have deployed two-factor. Richard Lawler of Engadget noticed that the company had added the feature early Wednesday morning, and Twitter users chimed in that Amazon’s security setting exited beta testing a couple of weeks ago. Enabling two-factor protects your accounts, because someone trying to access them needs both your normal login credentials and another piece of information—usually a randomly generated code that you get from an app or an SMS text that only works for a limited time. The first “factor” is your username and password and the second “factor” is the code you got from a device you own, usually your smartphone. A bad actor would have to know your username and password and have access to your phone in order to break into your account. Since there’s a good chance that Amazon accounts include active credit cards, it’s extra important to protect them. From amazon.com click Your Account–>Settings–>Change Account Settings–>Advanced Security Settings. Once you’re there, clicking Get Started will initiate a series of screens where Amazon walks you through the choices for getting two-factor codes from either text messages or an app. It takes three minutes and is totally worth it. Amazon’s security isn’t perfect, and Amazon accounts can definitely get hijacked if someone reuses an email address and password combination a lot and then it gets compromised. But so far the retailer has been relatively hack-free. Add two-factor now, in case that ever changes.